Leading up to the Home Tour, we’ll be highlighting each of the architects and their houses in exclusive interviews. Architect Jeff Rawlins of Architectural Artisans has updated the innovative circa 1937 Gilbert House, 1224 Larue Avenue (map) in the Prestonia neighborhood, with a new screened-in porch, swimming pool, and a reconfigured garage to create an overall composition that respects the house’s original modern design. Broken Sidewalk: Why should I come tour this house? Jeff Rawlins: You should come tour this house because it’s a rare opportunity to see and walk through a metal-panel house. Constructed in 1937 by R.F. Niemeier from a prefabricated kit, this model house was as much a glimpse into the future of houses as products, as it was a case study for creating durable economical living environments. Now almost 80 years later there is a slight nostalgia in the technology, but the spaces are still cozy and comfortable. Can you explain the historical aspects of the house? Metal panel houses are odd even by today’s standards. 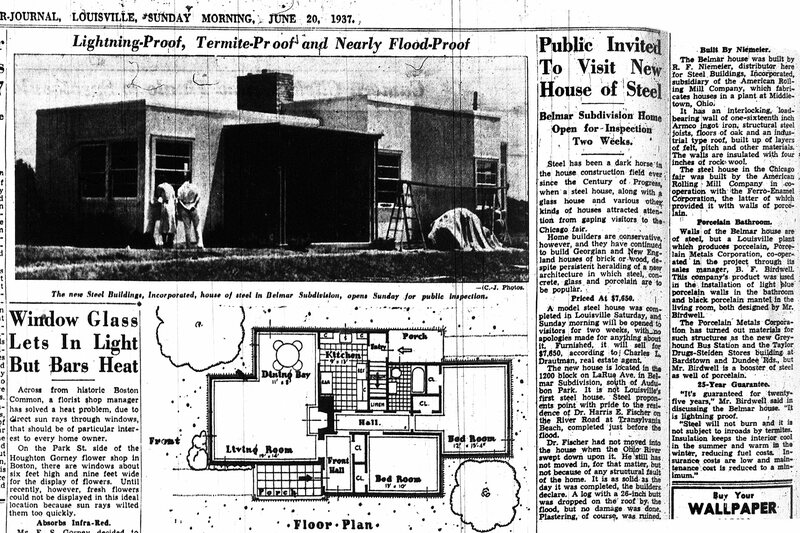 As mentioned in a 1937 article, various metal and glass house designs were explored at the Chicago world’s fair in the late 1800s after the Chicago fire. What I find interesting is the fact that this house was designed and marketed as a product complete and furnished for $7,650 in an era shortly after Henry Ford launched factory automobile production. Innovation and mass production had taken hold and there were individuals in Louisville willing to explore and vet new ideas. Which design elements are true to the house’s past? Which design elements are breaks from the past? The massing and scale of spaces are true to the house’s past. The colors and materials complement the house. 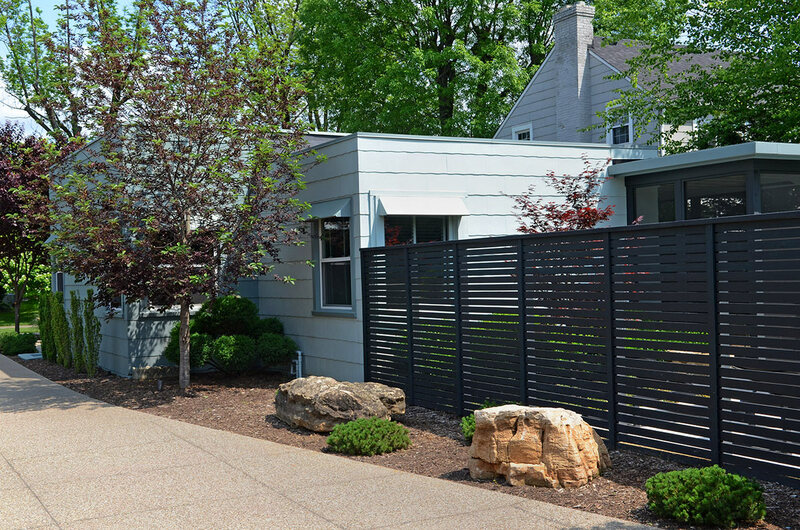 The detailing of the fence, garage facade, and porch break from the past as they are not prefabricated systems. The owner’s goal was to create outdoor spaces that complement the house and expand its livability. 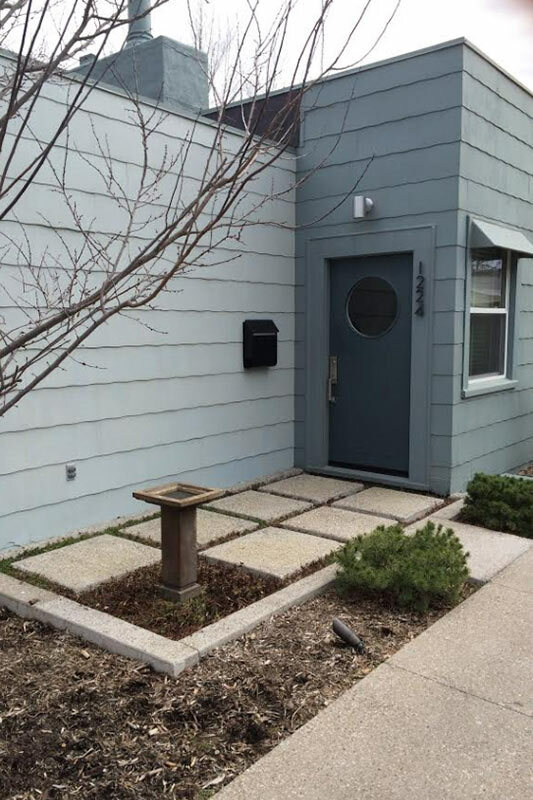 So instead of having a single open rear yard, the owner requested a variety of spaces that could accommodate a variety of different functions and activities depending on the climate, mood, or the social nature of those in the space. Specific items included a screened area with evening light, a heated and lighted pool, a fire pit with lounge seating, and some yard space for the dog to play. What concepts or specific elements inspired part of the design? Obviously the modern design of the house drove the aesthetics of the project. It was important to create a harmonious design that was respectful of the scale and materials of the existing house. The goal was to create a timeless environment that could have been created in 1937, 1960, or 2010. To keep cost down the screened-in porch was created with darkly painted wood. A cast stone was used for the flooring and patio to give the project a sense of permanence. And the dark siding on the garage facade was purposely milled to a small 3-inch lap to contrast with the larger house siding, be outside today’s conventional construction pallet, and relate more closely to the fencing. What was a splurge in this project? In a sense this project is the splurge. 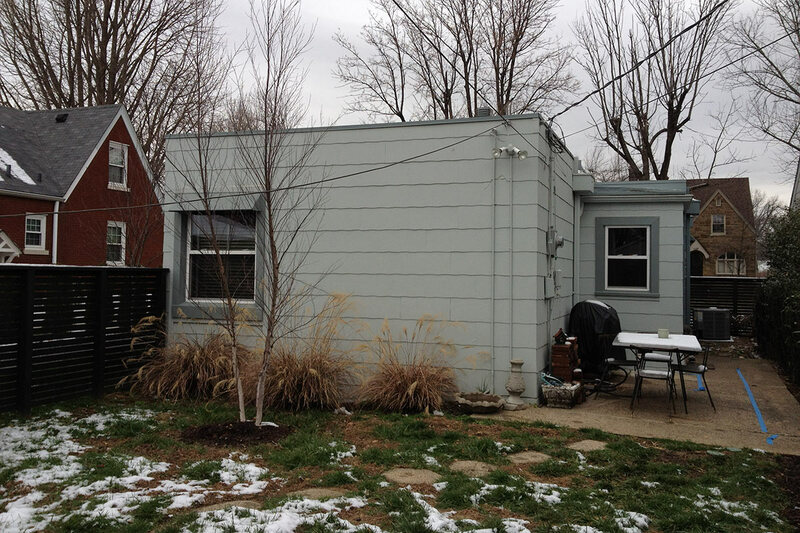 The modest metal house provided shelter and the necessities for living for almost 80 years. It is my opinion, though, that this project is the most important component when working with prefabricated housing. Houses that are well connected to the environment and context around them are simply more livable. What was the strategy for outdoor space or landscape? The strategy for the exterior spaces was to create a series of spaces with minimally defined edges. One example is the screen porch, which is defined by the roof and screen but the house siding and stone deck run seamlessly through the space. Another example are the two long, generous steps at the end of the pool that intentionally define a threshold between the pool space and the yard space. Another strategy was to use landscape materials to help reinforce the modern design, like the strong perimeter hedge or the delicate row of succulents planted between the porch and the pool.